Like a flying carpet, Andi Arnovitz’ latest works transport us to a world of gem-like color, where aesthetics and destruction meet in a deceptively beautiful dystopia. Her current show, “Threatened Beauty,” which opened March 16, 2015 at the L.A. Mayer Museum for Islamic Art in Jerusalem, contains some thirty works that deal directly or indirectly with subjects on the world’s mind right now, a nuclear Iran and the reign of terror and destruction by ISIS. Prime Minister Benjamin Netanyahu’s recent controversial speech in Congress focused the world’s attention on the threat posed by Iran’s thrust towards nuclear power, yet also referenced that civilization’s glorious past. The works depict both the prelude to potential destruction—as in “Facing Jerusalem” or “Fordow Underground” (one of the underground reactors hidden from inspectors until 2009) and some of the imagined results of destruction, but in a deceptively beautiful way. 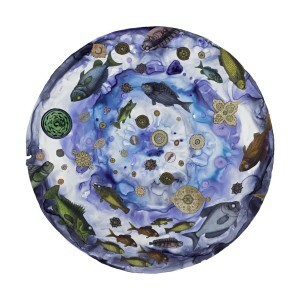 The fish floating in “Heavy Water II” could be part of a royal aquarium or fountain, so life-like and tranquil, if not for the realization that they have the glassy and vacant eyes of dead creatures. 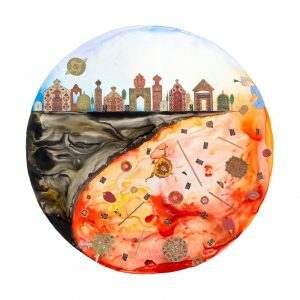 “Mutant Flora and Fauna,” takes traditional Persian artistic motifs and turns them into new and strange creations; “Displaced” shows endless rows of individuals, both adults and children, moving to unknown destinations in the wake of destruction. In “The Tipping Point”—black iridescent Iranian oil flows underground, but at any given moment it could be ignited to unleash an inferno. What might bring that moment on? 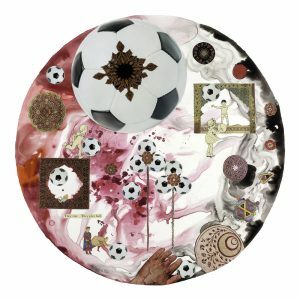 The work “Thirteen Boys,” deals with 13 teenagers who were summarily executed by ISIS for watching the Asian Cup soccer game on television in Mosul in January 2015. Words do not do justice to these works, which are at once both visually pleasing and deeply disturbing. How can this tension be sustained? Could the heirs of such a rich and aesthetic civilization unleash destruction? One’s answer may depend on where one sits. Let us hope that these works will not be prophetic, but only serve as a cautionary tale, a kind of “Thousandth and Second Night” that will remain in the realm of the imaginary.